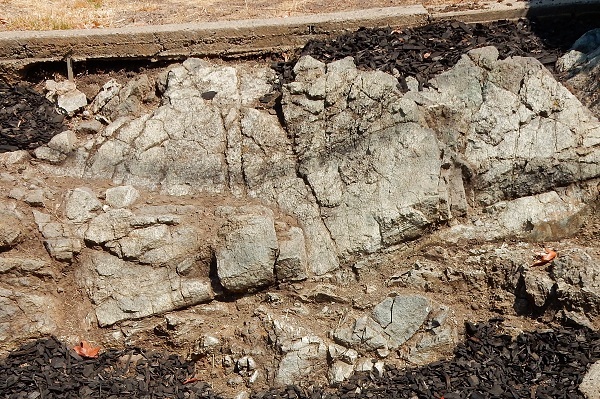 I’ve noted that while the San Leandro Gabbro has a presence in easternmost Oakland, it’s hard to find. 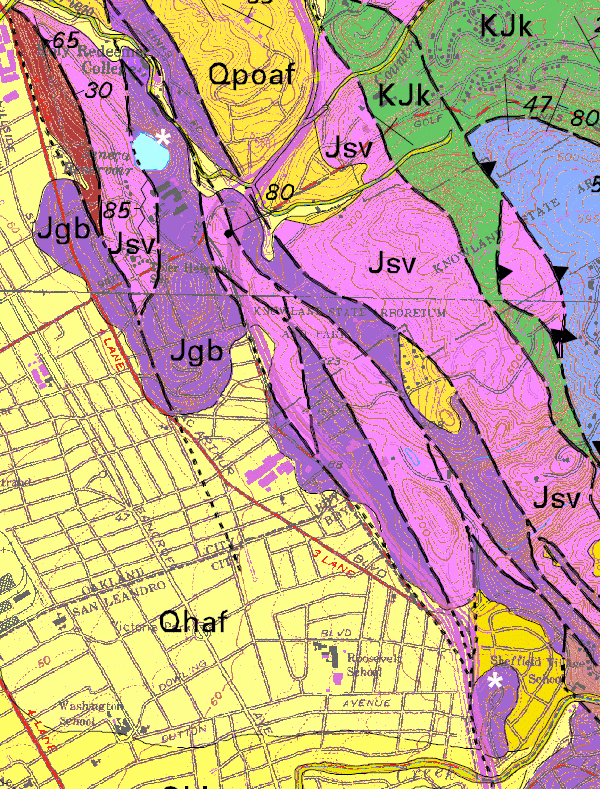 The geologic map shows what seems like a lot of it, marked “Jgb” for Jurassic gabbro. But if you poke around on the ground, nearly all of those sites are inaccessible due to steep woods, roads or housing tracts. But once last year and once the year before, I found some. The two spots are marked on the map with white asterisks. 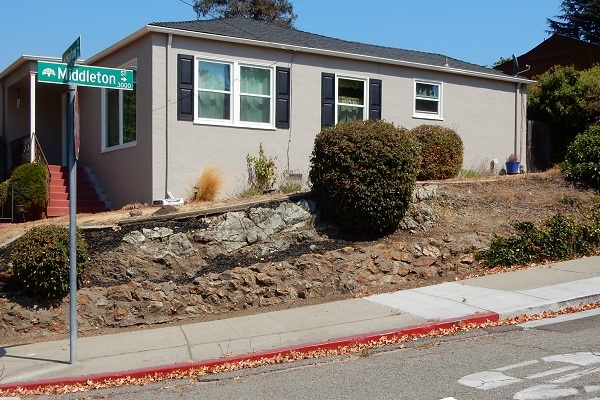 The northern one is at Seneca Reservoir, right next to the Hayward fault, and the southern one is in Sheffield Village at the north end of Middleton Street where it meets Marlow Drive. The northern site, Seneca Reservoir, was once the upper pit of the old Catucci quarry. (The lower pit was repurposed as the site of Bishop O’Dowd High School.) Not much of it is accessible, but here and there you can spot pieces of the quarry waste. It looks like nothing else in town and everything like San Leandro’s namesake stone. I can’t say the same for the Middleton Street exposure, but on the positive side it’s real easy to visit. Oddly, the last time I came through here, in 2013, I paid it no mind, focusing instead on the other side of the street. This site too is very near a strand of the Hayward fault, so it’s been rattled and squeezed for quite some time. It has a battered appearance, even a little fried. And no matter how close you get, it doesn’t show much detail. 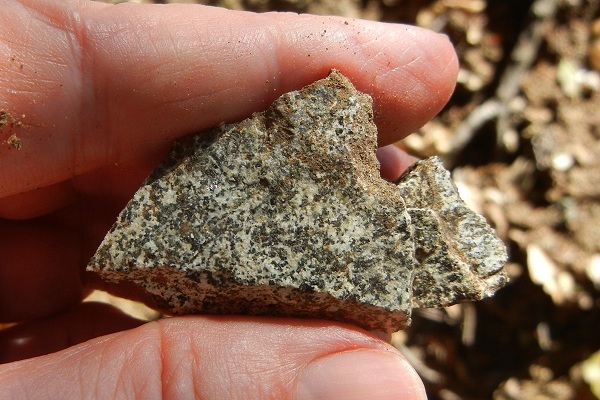 As a whole, though, it has the typical color of the gabbro: light gray with a slight blue-green tinge. 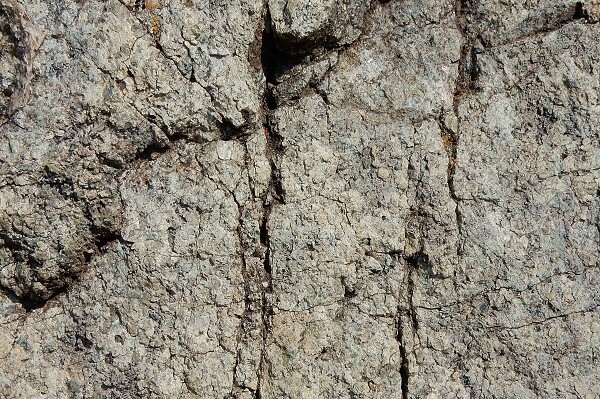 This resulted from petrochemical disruption at the time of its eruption, some 165 million years ago, when a pulse of younger magma sent up fluids that changed its black pyroxene minerals into green amphibole and some other greenish minerals — an obscure process known as uralitization. I mentioned the Hayward fault being next to the reservoir. We probably would think twice before building that there today. This entry was posted on 20 February 2017 at 8:02 am and is filed under Oakland rocks. You can follow any responses to this entry through the RSS 2.0 feed. You can skip to the end and leave a response. Pinging is currently not allowed.